Call thousands of destinations around the world. Rates as low as 1¢ per minute! With the $10 Global Calling Card§ you can call destinations not included with Basic International. Covers both cell phones and landlines. Simply keep your service active and you can add as many cards as you'd like at any time. This card is for international calls originating in the United States only and does not offer international roaming. To make calls just dial Access Number 305‑938‑5673 or download the FREE Tracfone International Dialer app for Android here. When downloading and using this app, standard data rates may apply. You must have active service to use this card. This card does not add Service Days. To check rates, enter the country you wish to call. Unlimited Carryover®: Service must be active and in use within any six month period. 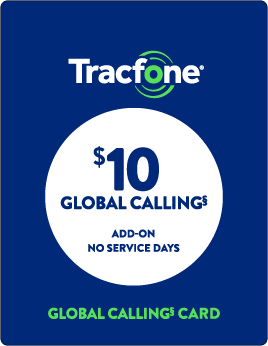 § The $10 Global Calling Card must be combined with another Tracfone Service Plan to work. Calls must originate from the US and Puerto Rico only. No International Roaming is allowed. Only for personal use. Calls are deducted in one‑minute increments. Airtime minutes will be deducted plus the cost of the International call. Rates are subject to change without prior notice. Card benefits expire 180 days from last use or 30 days after your Service is suspended, whichever occurs first. Call hundreds of International destinations for the same price as a local call, including Colombia, India and more. No sign‑up is needed. You can start using it right now! Calls to cellular phones are not included unless the word "CELLULAR" is specifically listed next to the country name. Numbers in parentheses indicated the Country Code. International Destinations include cities within the countries listed below. From your Tracfone, DIAL 305‑938‑5673. From Alaska, Hawaii, and the U.S. Virgin Islands please dial 305‑938‑5673. Select your language (1‑English, 2‑Spanish). Listen to dialing instructions. (Instructions can be interrupted at any time and you can skip to step 3). DIAL 001 + country code + city code + telephone number. (For Bahamas, Bermuda, Canada, and Dominican Republic just dial: 1 + city code + telephone number). Note: Please wait to be connected; DO NOT press any other key on your Tracfone or you might be disconnected. Download the free app, for the easiest way to make International calls. Tracfone's International NeighborsSM eliminates long‑distance charges. By dialing a local telephone number, your friends and family in Mexico can call your Tracfone directly here in the U.S.
Tracfone's Frequent Numbers is an online service that provides you with 1-800 numbers you can assign to your most frequent dialed international numbers. No more dialing the international access number, plus country code, plus phone number, etc. International calling available to over 100 destinations worldwide. Countries are subject to change without prior notice. For international calls dial 305-938-5673. Airtime deductions apply. International text messages and roaming are not allowed. Please refer always to the latest Terms and Conditions of Service at Tracfone.com. Tracfone is a registered trademark of TracFone Wireless, Inc.
Android, Google Play and other marks are trademarks of Google Inc.